For many years, metal beads have been used for producing jewellery. They definitely aren't light, but they are easy to use and tough. 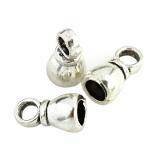 In our shop, you will find a wide range of metal beads. We sell elements in small and big sizes from 5,5mm to 8x15mm. We recommend metal beads from wire, decorative ones (in the shapes of flowers, butterflies and fish), glossy snow globes and ready-made charms. If you prefer lighter elements, in our shop, you can find colourful aluminium beads in the shapes of cubes, balls, ovals and teardrops. Metal elements are very often used in jewellery as components like dividers and fasteners. 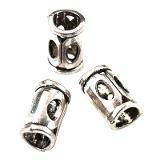 In our shop, you will find many metal semi-products for jewellery also spacers. Metal beads aren't usually associated with delicate, girly jewellery. However, they will be perfect for punk jewellery. A bracelet or a necklace from metal elements is the essence of this style. 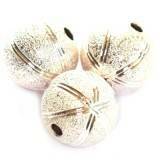 If you prefer classy style, combine metal beads with glass ones. Such a combination will certainly overcome the monotony. 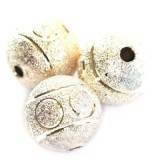 Metal beads also called sometimes spacers, are very nice product to make jewellery with semi precious stones or glass beads. Usually you put one metal bead and some stones or glass beads, you connect them with stringing material and jewellery findings. We sale many different shapes, sizes in retail or bulk bags. Our price are one of the cheapest on the market. Metal beads are an extensive category of products in which there are unique models of beads and hangers. 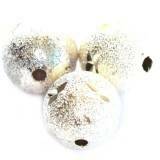 Wire beads in the form of metal wire balls are extremely effective. Irregularly wrapped wires form picturesque esces-flores, from which you can conjure up a magical charm and necklaces and bracelets. Such a set will perfectly harmonize with a black outfit, eg with a velvet dress. In this category there are also metal beads on the beads, which can be applied to any bead, eg in the shape of a ball, to revive it a little or give it an interesting look. Metal spacers with cubic zirconia will separate the beads of the same color, creating a pleasing ornament in a unified string of beads. 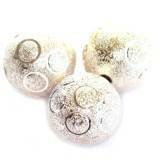 Beads in the form of snow balls are interesting elements, from which you can make a delicate, very feminine, jewelry. 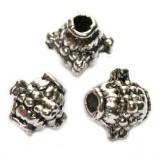 The online store offer includes, among others, metal beads. They are used to create beautiful jewelry that you can do yourself. Thanks to this, you will have unique, unique jewelry that will look nice on you, your family, friends and other people who wear it. Necklaces, bracelets, rings, earrings and many more can be conjured with beads that you buy in the online store. It is available 24 hours a day. You can always buy yourself the metal beads necessary to do something nice for yourself and others. They are made of metal that is resistant to use. Jewelry made of them can be designed for women in various age categories. Adults, teenagers, everyone will find something for themselves. They will adapt to the stylization you wear on special occasions, meetings with family and friends. They work well in many situations. 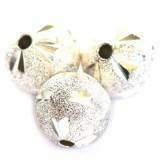 Do not hesitate and order metal beads. You save valuable time and money. You will not look for beads in stationary stores. Choose the form of delivery and payment, and the courier will bring you your beads to the address indicated. For details, regulations, please visit our bead shop. You can join them with semi-precious stones, Swarovski crystals or glass beads. Your jewellery will look much better when you will use them.